"Are You Seeing Giants in the Land? Then Get Excited!" Oftentimes we are dealing with severe battles and attacks JUST BEFORE there is breakthrough and seeing our promises come to pass. It was a Saturday morning, and I was driving to my office to catch up on some work. I had music playing on my media player. As one song came to an end and another began to play, capturing my attention. It was a song I have listened to many times before, but today, God began to show me something in the simple, yet powerful words of this song. The song is called "Giants." One part of the song exploded in my spirit. It said, "I see giants in the land ... I see promise. I see promise." I pulled out my Bible as soon as I got to my office and re-read the story in Numbers 13. God had led His people to their Promised Land. It was time for them to enter in. We all know the story. They did not enter in because they were afraid of the giants in the land. The Bible says they didn't enter in because of unbelief. Numbers 13:1 teaches us that it was GOD who told Moses to send men in to spy out the land. God knew they would see the fruitfulness of the land. He also knew they would see the giants. His hope was that they would believe what He had said more than what they saw. Knowing they would see the giants, why did He send them in to spy out the land? I believe one reason is the promise He made to Moses. We find this promise in Joshua 1:3: "I have given you every place where the sole of your foot will tread, just as I promised to Moses." That morning, as I listened to the words of the giant song, I realized a profound truth: If we are seeing giants ... we are seeing promise. We have come to the borders of our Promised Lands. What we do at this point is up to us. Will we do as the children of Israel did and cry, "Oh, the giants are too big! We can't fight them, we are no match for them, let's go back." Or, will we be like Joshua and Caleb and declare, "The land we passed through to spy out is an exceedingly good land. If the Lord delights in us, then He will bring us into this land and give it to us, 'a land which flows with milk and honey.' Only do not rebel against the Lord, nor fear the people of the land, for they are our bread; their protection has departed from them, and the Lord is with us. Do not fear them" (Numbers 1:7a-9). As some of you may know, I have battled sickness many times in the past few weeks. One person told me, "Perhaps you have a door open to the enemy." Trust me, I have prayed everything I know to pray. There is no open door to the enemy that I am aware of. And I truly believe God would show me if there was. The Israelites' promise was literal land, a land flowing with milk and honey. Our land is different. It includes all Jesus paid for at the Cross. Our promises may indeed include land and homes. But our promises also include health, wholeness, healing, wealth, peace of mind, protection and so much more. All our promises in God are yes and amen – yes, and so be it. What did God say when He saw their reaction? Let's look. Numbers 14:11 says, "Then the Lord said to Moses: 'How long will these people reject Me? And how long will they not believe Me ...?'" When we fail to face our giants head on and fight for our promise, God takes it as rejection. He sees it as unbelief. That being said, I know many of us are weary – trust me, I get it. However, GOD IS OUR STRENGTH. The joy of the Lord is our strength. We CAN and must overcome. We cannot stop now, we are too close to our promise ... we must press on. These giants, they are our bread. They are food for us. In overcoming them, our promise will manifest. And we can overcome each and every one of them. How do I know? Because God is with us! God has said that this promise belongs to us and He is with us. Greater is He that is in us! Through Christ we are more than conquerors. All things are possible to him who believes. With God nothing is impossible. That's how I know. It's time, my friend. Face your giants. Defeat them. Eat of them for they are your bread, and then lay hold of all God has for you. 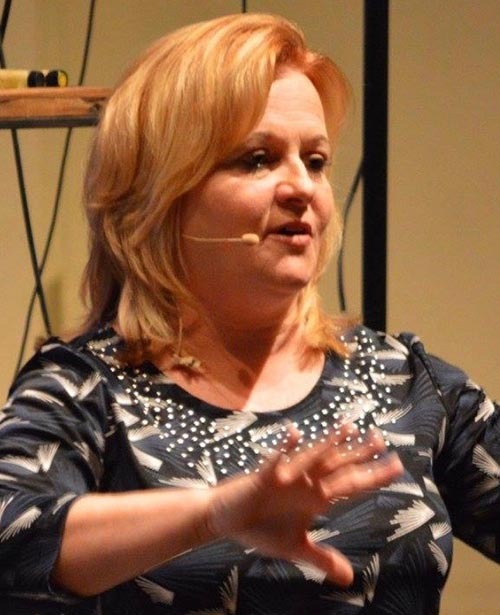 Kim Potter is the founder of A New Thing Ministries, which sends a daily teaching to over 10,000 people all around the world. Her articles have appeared on The Elijah List, Charisma, Spirit Fuel and iBelieve.com. Kim's message is one of hope. She speaks to the heart of those who have grown discouraged and disappointed by the circumstances of life and imparts the desire and ability to stand against all odds; to stand for victory. She encourages people to press into God and discover that He is who He says He is.